How Colin Kaepernick is viewed in 20 years will be fascinating to see, but it is increasingly likely that this is a man who will be remembered as one of the most significant civil rights campaigners of the early 21st century. Gone are the days of Kaepernick the quarter-back. While he was undoubtedly good enough to be on an NFL roster last year and probably could make a roster this season, the fact remains that a player suing the league for collusion is unlikely to get picked up any time soon. His time tossing the pigskin around has passed but the conversation he began by kneeling before a pre-season game that barely anyone watched and even fewer people cared about has exploded into a focal point of America's struggle with racial equality. News of Nike's big bet on Kaepernick, the launching of a new range bearing the former 49er's image and name, inevitably caused anger with those of a 'Make America Great Again' persuasion. Permanently outraged by a black man's freedom to act within his constitutional rights, the thought of Kaepernick also earning some money was simply too much to take for the legions of internet fools who have spent the hours since the announcement burning Nike products for which they have already paid. A 'boycott' - or anything resembling normal behaviour - it is not, but the focus on Nike poses the question as to what their thinking is behind the new partnership. For the 30-year anniversary of the American sportswear giant, they have chosen not to shy away from one of America's most hot-button issues and a monochrome picture of Kaepernick's face is accompanied by the line "Believe in something, even if it means sacrificing everything." 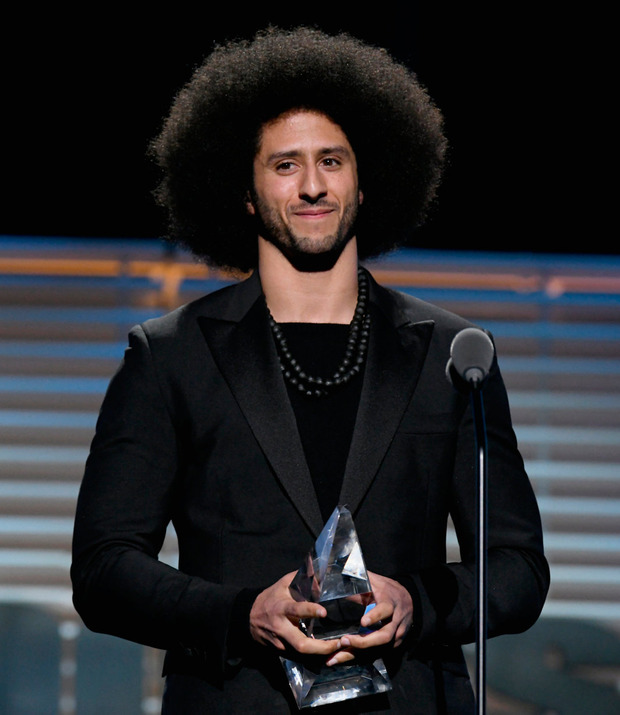 Gino Fisanotti, Nike's vice-president of branding for North America, told ESPN: "We believe Colin is one of the most inspirational athletes of this generation, who has leveraged the power of sport to help move the world forward." Nike didn't have quite the same attitude when it came to other sports stars. Enes Kanter plays in the NBA for the New York Knicks and got the cold shoulder from Nike after he had spoken out against authoritarian Turkish president Recep Erdogan, who has crushed dissent and jailed journalists and academics who criticised him. "Outside of the court, I make almost no money because of all the Turkish stuff," Kanter said earlier this year. "Most companies are scared to give me any contract because of what's going on in Turkey." Nike knows the American market better than the Turkish market, of course, but they have made some curious moves at home too. The Oregon-based sports brand ditched all-star quarter-back Michael Vick after he was sent to prison in 2007 for his involvement in a dog-fighting ring where Vick admitted to hanging and/or drowning dogs as well as abusing and torturing them. In a perplexing twist, however, they re-signed him in 2011, almost immediately after his release and much to the dismay of animal rights campaigners. They also stuck with Tiger Woods during the very public breakdown of his marriage due to numerous infidelities, even taking the provocative step of running a campaign with the knowing tagline: "Winning takes care of everything". It is only fair to say at this point that Nike have clearly tried to change tack, especially so after being embroiled in damaging associations through the Fifa corruption investigations by the FBI and US Department of Justice as well as Project Oregon and controversial Nike running coach Alberto Salazar. They have, in recent years, cut ties with genuine superstars like Lance Armstrong (doping), Manny Pacquiao (homophobic comments), Adrian Peterson (child abuse) and Maria Sharapova (doping) for their conduct, but what Kanter alleges is that they shied away from him because of his activism. It suggests the Kaepernick endorsement is opportunism, rather than activism. When it comes to the bottom line - and that, unsurprisingly, is what matters most in all of these endorsements - any sportsman with a Nike deal is an ambassador for their brand. That they have chosen Kaepernick, one of the best-known civil rights activists on the planet, to be associated with their brand should probably not be a surprise for a company that is clearly now targeting a younger and more diverse audience. It is why Nike's great rivals adidas have an enormous apparel deal with Kanye West - not a sportsman but still a huge name, a star whose name they would like to attach themselves to in order to sell their products. For Nike, Kaepernick is a famous person whose following is to be harnessed for profit. That they have felt emboldened enough to pick sides in an issue so divisive that the president has publicly abused the players involved is what makes it so intriguing. It is a major corporation placing themselves on one side of the fence where companies so often are happy to just take the splinters. This is not activism nor altruism, as it may end up being portrayed, but that does not mean it is not significant.